NYU-DC, Facade Rendering. Courtesy of Hickock Cole Architects. A lot of universities’ have academic hubs in D.C., but none have one quite like this. This month, Hickock Cole Architects will break ground on a brand new academic center for New York University on L Street, NW. NYU’s new Constance Milstein and Family Academic Center, also known as NYU-DC, will be a 12-story building with academic space and six floors of dormitories. The new building is also aiming for LEED Gold. 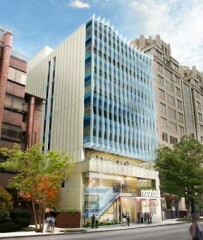 NYU-DC will be located at 1307 L St, NW.